Up to 250 radon-related lung cancer cases are diagnosed in Ireland each year. 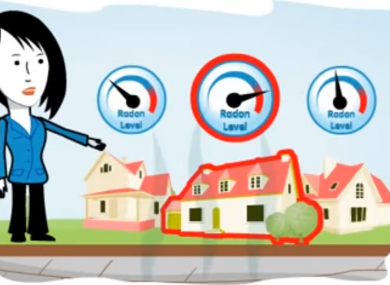 A radon awareness video released by the Environmental Protection Agency. LARGE AREAS OF the west of Ireland have been found to contain potentially dangerous levels of the naturally occurring gas radon. The latest findings from the Tellus programme showed that some areas of east Galway in particular were ‘hotspots’ for potential build-ups of the gas, which has been linked to the development of lung cancer. The study showed that there were “extensive areas of fractured limestone” which can be exploited by naturally occurring radon gas leading to large accumulations of the gas within soil. Radon is a naturally occurring radioactive gas with no colour, taste or smell which can increase the risk of developing lung cancer. Up to 250 radon-related lung cancer cases are diagnosed in Ireland each year, according to the Environmental Protection Agency (EPA). According to the Department of the Environment, radon quickly dilutes to harmless concentrations but the gas can accumulate to unacceptably high concentrations within an enclosed space, including a house, if not detected. It is this accumulation which can pose a threat to health. Using the data, the Tellus Programme is working alongside the EPA to further improve understanding of the distribution of radon gas to update maps and guidance for communities, planners. Junior Minister Sean Kyne TD welcomed the data from the Tellus programme and said the data confirms the EPA’s message that parts of Galway are at high risk from radon. Up to 250 radon-related lung cancer are diagnosed in Ireland each year. Email “Warning to locals as high rates of cancer-causing radioactive gas discovered in Galway ”. Feedback on “Warning to locals as high rates of cancer-causing radioactive gas discovered in Galway ”.